From time to time I receive emails about cool new tools I should check out or requests to grant another author the opportunity write on my blog. I enjoy those interactions (although still feel like this blog is my personal space to write and share -- which is why I've declined the guest blog posts). But today I received a pretty special email that propelled me directly here to my blog to share with you. When I speak with educators about transforming learning through technology, I hear all the reasons why we "can't" or why it's too "hard" to transform the way we have our students reach their learning objectives or standards. But every now and then, we find an example of a "mover" who makes it happen. A person driven from within by a passion for learning that is uninterrupted by all the hurdles that others stumble over. 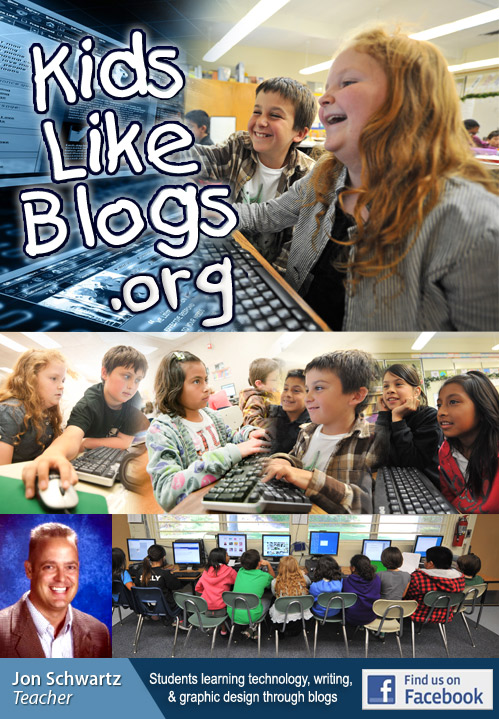 Today I was introduced to the Kids Like Blogs project, a product of Mr. Schwartz who teaches 4th and 5th grade in Oceanside, CA. The concept sounds pretty simple: each child was set up with an individual blog, carefully and securely utilizing anonymity, on which s/he would write 90 words each day. These were kids who were not only reluctant to write but wouldn't write. The kids quickly learned that writing for an authentic audience holds more extrinsic value when they began to track the number of hits and comments they received. That extrinsic motivation triggered an intrinsic response -- and a new found love for writing. And Mr. Schwartz, a blogger himself, kept his students' privacy and security a priority by approving each blog post and each comment before they appeared online. Wrapped up in this success story is a close partnership with parents who are educated about the value of blogging and also give permission before a child can participate. Now here's the part that really floored me. Many of the students participating in the project come from homes where the parents only speak Spanish. The children, English language learners, are showcasing their writing online and their literacy and self-confidence is soaring. Why does that surprise me so? Because this is yet another hurdle that I frequently hear cited for not using technology based projects. The fact that Mr. Schwartz believes in, not only, his students but also the parents of his students and opens the door for them to demonstrate their potential is golden. it at the last possible moment. just a toy, and is gaining skills that he will use throughout his life." This example demonstrates so many different things but let's not miss the critical element of Schwartz's own participation in the blogging community. Educators who blog need to be rewarded. Education leaders need to incentivize participation in social media, as participation is the only way to truly comprehend the learning value of the tools that comprise the web 2.0 era. Thank you, Mr. Schwartz, for sharing your terrific project with me! Keep up the great work (same goes for your students and their parents).